Formerly known as Winterland, French metal band Silent Fall brings their first full-length album, Otherwise, on Cyprus based Pitch Black Records. The essence of Silent Fall is melodic power metal, but they also try to work in some modern metal elements including some harsh death metal vocals. As usual, the latter adds nothing to the music, and is a perfect waste of vocalist Adrien Eyraud's talent. As for the music itself, Otherwise begins with some very generic European power metal, and you've heard it all before. 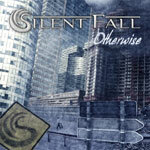 However, Silent Fall improves with One Cold Winter Night which offers some sublime piano and acoustic guitar. Following this, I Wish and Play with Fire begin to display both Silent Fall's fine song composition and musical talent. Both songs offer some progressive twists and turns. Vocal arrangements are at a premium throughout Otherwise, and none better are found on the aforementioned One Cold Winter Night and This Could Have Been, which incorporates some female vocals from Marjolaine Bernard (Wildpath). The album concludes with more euro-power metal with On Top of the World having a more epic symphonic feel. Otherwise is a strong effort from Silent Fall, even with a large measure of generic power metal. The promise of greater things to come is found when they introduce more progressive elements in their compositions. Otherwise is a strong effort from Silent Fall, even with a large measure of generic power metal. The promise of greater things to come is found when they introduce more progressive elements in their compositions.